In this study, we investigated the sensitivity components of demethylation fungicide inhibitors (DMI-tebuconazole) for two different sensitivity genotypes of Monilinia fructicola (G461S mutants and wild-type isolates). These components included the fungicide resistance stability and fitness studied over the course of nine and five successive transfers in vitro and ex vivo, respectively, in the absence of fungicide. The results showed no effect of successive transfers on tebuconazole sensitivity of isolates with the G461S mutation for in vitro and ex vivo assays. Athough stable resistance was found, resistant isolates demonstrated a fitness disadvantage relative to the wild-type isolates. The in vitro assay revealed that wild-type isolates had higher germination rates and mycelial growth capacity; and when tested ex vivo, wild-type isolates could produce more spores and larger lesions in peach fruit. The competition studies corroborate the predicted fitness results, where resistant spores were less frequently re-isolated from two pairs of resistant and sensitive mixtures prepared at different ratios. 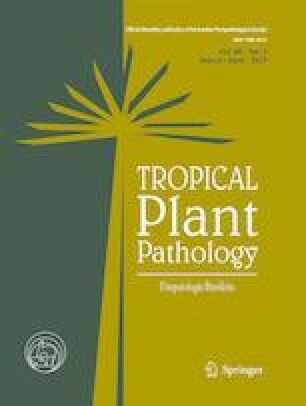 The results obtained in this study have important implications for tebuconazole resistance management of stone-fruit orchards in Brazil and field tests are currently underway to confirm its practicality. The online version of this article ( https://doi.org/10.1007/s40858-018-0254-9) contains supplementary material, which is available to authorized users. We thank David Morgan and Michael Luna from the University of California Davis/Kearney Agricultural Research and Extension Center for their technical assistance and Bayer SA for supplying the fungicide used in this study. A special appreciation to the Coordination for the Improvement of Higher Education Personnel (CAPES) doctoral fellowship for making this study possible both in Brazil and in California. This study is based upon work supported by Conselho Nacional de Desenvolvimento Cientifico e Tecnológico grants no 479041/2010-5 Universal/CNPq and grant no 552334/2011-1 CNPQ-Procad.